William Jennings Bryan (19 March 1860 – 26 July 1925) was an American lawyer, statesman, and politician. He was a three-time Democratic Party nominee for President of the United States, and famously supported Tennessee's Butler Act against the teaching of evolution at the Scopes Trial of 1925. No government can long endure unless its citizens are willing to make some sacrifice for its existence. In this, our land, we are called upon to give but little in return for the advantages which we receive. Shall we give that little grudgingly? Our definition of patriotism is often too narrow. Shall the lover of his country measure his loyalty only by his service as a soldier? No! Patriotism calls for the faithful and conscientious performance of all of the duties of citizenship, in small matters as well as great, at home as well as upon the tented field. There is no more menacing feature in these modern times than the disinclination of what are called the better classes to assume the burdens of citizenship. If we desire to preserve to future generations the purity of our courts and the freedom of our people, we must lose no opportunity to impress upon our citizens the fact that above all pleasure, above all convenience, above all business, they must place their duty to their government; for a good government doubles every joy and a bad government multiplies every sorrow. Times change but principles endure. The jury has protected us from the abuse of power. While human government exists the tendency to abuse power will remain. This system, coming down from former generations crowned with the honors of age, is today and for the future our hope. Let us correct its defects with kindly hands, let us purge it of its imperfections and it will be, as in the past, the bulwark of our liberties. A man who murders another shortens by a few brief years the life of a human being; but he who votes to increase the burden of debts upon the people of the United States assumes a graver responsibility. Plutocracy is abhorrent to a republic; it is more despotic than monarchy, more heartless than aristocracy, more selfish than bureaucracy. It preys upon the nation in time of peace and conspires against it in the hour of its calamity. Conscienceless, compassionless and devoid of wisdom, it enervates its votaries while it impoverishes its victims. It is already sapping the strength of the nation, vulgarizing social life and making a mockery of morals. The time is ripe for the overthrow of this giant wrong. 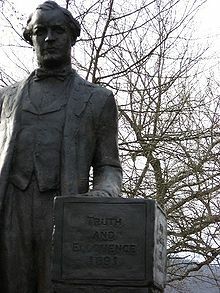 In the name of the counting-rooms which it has denied; in the name of business honor which it has polluted; in the name of the home which it has despoiled; in the name of religion which it has disgraced; in the name of the people whom it has opprest, let us make our appeal to the awakened conscience of the nation. As quoted in "Osborn States the Case For Evolution", in The New York Times (12 Jul 1925), p. XX1; the tooth was misidentified as anthropoid by Osborn, who over-zealously proposed Nebraska Man in 1922; the tooth was shortly thereafter found to be that of a peccary (a Pliocene pig) when further bones were found. A retraction was made in 1927, correcting the scientific blunder. Appearance too often takes the place of reality — the stamp of the coin is there, and the glitter of the gold, but, after all, it is but a worthless wash. Sham is carried into every department of life, and we are being corrupted by show and surface. We are too apt to judge people by what they have, rather than by what they are; we have too few Hamlets who are bold enough to proclaim, "I know not seem!" But if each day we gather some new truths, plant ourselves more firmly upon principles which are eternal, guard every thought and action, that it may be pure, and conform our lives more nearly to that Perfect Model, we shall form a character that will be a fit background on which to paint the noblest deeds and the grandest intellectual and moral achievements; a character that cannot be concealed, but which will bring success in this life and form the best preparation for that which is beyond. Character is the entity, the individuality of the person, shining from every window of the soul, either as a beam of purity, or as a clouded ray that betrays the impurity within. The contest between light and darkness, right and wrong, goes on; day by day, hour by hour, moment by moment, our characters are being formed, and this is the all-important question which comes to us in accents ever growing fainter as we journey from the cradle to the grave, "Shall those characters be good or bad?" This is not a contest between persons. The humblest citizen in all the land, when clad in the armor of a righteous cause, is stronger than all the hosts of error. I come to speak to you in defence of a cause as holy as the cause of liberty—the cause of humanity. We object to bringing this question down to the level of persons. The individual is but an atom; he is born, he acts, he dies; but principles are eternal; and this has been a contest over a principle. There are two ideas of government. There are those who believe that, if you will only legislate to make the well-to-do prosperous, their prosperity will leak through on those below. The Democratic idea, however, has been that if you legislate to make the masses prosperous, their prosperity will find its way up through every class which rests up on them. If they dare to come out in the open field and defend the gold standard as a good thing, we will fight them to the uttermost. Having behind us the producing masses of this nation and the world, supported by the commercial interests, the laboring interests and the toilers everywhere, we will answer their demand for a gold standard by saying to them: You shall not press down upon the brow of labor this crown of thorns, you shall not crucify mankind upon a cross of gold. Science has made war so hellish that civilization was about to commit suicide; and now we are told that newly discovered instruments of destruction will make the cruelties of the late war seem trivial in comparison with the cruelties of wars that may come in the future. "God and Evolution", in The New York Times (26 Feb 1922), p, 84; rebuttals by Henry Fairfield Osborn and Edwin Grant Conklin were printed a few days later. The first objection to Darwinism is that it is only a guess and was never anything more. It is called a “hypothesis,” but the word “hypothesis,” though euphonioous, dignified and high-sounding, is merely a scientific synonym for the old-fashioned word “guess.” If Darwin had advanced his views as a guess they would not have survived for a year, but they have floated for half a century, buoyed up by the inflated word “hypothesis.” When it is understood that “hypothesis” means “guess,” people will inspect it more carefully before accepting it. The only part of evolution in which any considerable interest is felt is evolution applied to man. A hypothesis in regard to the rocks and plant life does not affect the philosophy upon which one's life is built. Evolution applied to fish, birds and beasts would not materially affect man's view of his own responsibilities except as the acceptance of an unsupported hypothesis as to these would be used to support a similar hypothesis as to man. The evolution that is harmful— distinctly so — is the evolution that destroys man’s family tree as taught by the Bible and makes him a descendant of the lower forms of life. This … is a very vital matter. I have been so satisfied with the Christian religion that I have spent no time trying to find arguments against it. … I am not afraid now that you will show me any. I feel that I have enough information to live and die by. If they believe it, they go back to scoff at the religion of their parents. I can make affirmation; I can say "So help me God, I will tell the truth." I have studied the Bible for about 50 years, or sometime more than that, but, of course, I have studied it more as I have become older than when I was but a boy. … I believe everything in the Bible should be accepted as it is given there: some of the Bible is given illustratively. For instance: "Ye are the salt of the earth." I would not insist that man was actually salt, or that he had flesh of salt, but it is used in the sense of salt as saving God's people. When I read that a "big fish" swallowed Jonah — it does not say whale. That is my recollection of it. A big fish, and I believe it, and I believe in a God who can make a whale and can make a man and make both what He pleases. … One miracle is just as easy to believe as another. … It is hard to believe for you, but easy for me. A miracle is a thing performed beyond what man can perform. When you get within the realm of miracles; and it is just as easy to believe the miracle of Jonah as any other miracle in the Bible. These gentlemen have not had much chance — they did not come here to try this case. They came here to try revealed religion. I am here to defend it and they can ask me any question they please. The reason I am answering is not for the benefit of the superior court. It is to keep these gentlemen from saying I was afraid to meet them and let them question me, and I want the Christian world to know that any atheist, agnostic, unbeliever, can question me anytime as to my belief in God, and I will answer him. … Your honor, they have not asked a question legally and the only reason they have asked any question is for the purpose, as the question about Jonah was asked, for a chance to give this agnostic an opportunity to criticize a believer in the world of God; and I answered the question in order to shut his mouth so that he cannot go out and tell his atheistic friends that I would not answer his questions. That is the only reason, no more reason in the world. If you will take the second chapter — let me have the book. [Reaches for a Bible.] The fourth verse of the second chapter says: "These are the generations of the heavens and of the earth, when they were created in the day that the Lord God made the earth and the heavens," the word day there in the very next chapter is used to describe a period. I do not see that there is any necessity for construing the words, "the evening and the morning," as meaning necessarily a 24-hour day, "in the day when the Lord made the heaven and the earth. "… I think it would be just as easy for the kind of God we believe in to make the earth in six days as in six years or in 6 million years or in 600 million years. I do not think it important whether we believe one or the other. … My impression is they were periods, but I would not attempt to argue against anybody who wanted to believe in literal days. Your Honor, I think I can shorten this testimony. The only purpose Mr. Darrow has is to slur at the Bible, but I will answer his question. I will answer it all at once, and I have no objection in the world. I want the world to know that this man, who does not believe in a God, is trying to use a court in Tennessee to slur at it, and while it will require time, I am willing to take it. In war, science has proven itself an evil genius; it has made war more terrible than it ever was before. Man used to be content to slaughter his fellowmen on a single plane — the earth's surface. Science has taught him to go down into the water and shoot up from below and to go up into the clouds and shoot down from above, thus making the battlefield three times a bloody as it was before; but science does not teach brotherly love. Science has made war so hellish that civilization was about to commit suicide; and now we are told that newly discovered instruments of destruction will make the cruelties of the late war seem trivial in comparison with the cruelties of wars that may come in the future. History had been unkind to William Jennings Bryan, characterizing him as a Bible-thumping buffoon. Bryan was anything but the bumpkin he is made out to be in common accounts of the Scopes trial. … William Jennings Bryan was a great American hero, someone in whom people on the Left can take a sympathetic interest. A century ago, he was a leading populist politician … He was a strong opponent of the runaway capitalism of his day and fought hard and effectively for progressive social change, including votes for women, progressive income tax, and for getting the United States off the gold standard, which was a terrible burden on the American working class. 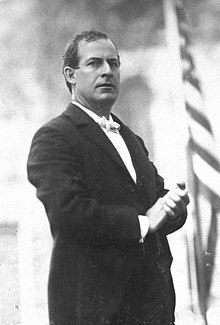 Unfortunately for the Republicans, William Jennings Bryan was a great orator and took the early lead in the public's eye. Bryan, flashing steel-blue eyes and well-kept teeth, vowed to fight the money kings of Wall Street and wholly supported unlimited coinage of silver. As for William Jennings Bryan, of whom so much piffle, pro and con, has been written, the whole of his political philosophy may be reduced to two propositions, neither of which is true. The first is the proposition that the common people are wise and honest, and the second is the proposition that all persons who refuse to believe it are scoundrels. Take away the two, and all that would remain of Jennings would be a somewhat greasy bald-headed man with his mouth open. Bryan was a vulgar and common man, a cad undiluted. He was ignorant, bigoted, self-seeking, blatant and dishonest. His career brought him into contact with the first men of his time; he preferred the company of rustic ignoramuses. … Imagine a gentleman, and you have imagined everything that he was not. Called by his admirers the Great Commoner, William Jennings Bryan was a tireless defender of the poor against the rich and a prophet of reform and humanitarianism. Without a doubt he was the voice of the Democratic party at the turn of the century, and his style and dedication kept him at center stage for thirty-five years of turbulent American politics. Direct observation of the testimony of the earth ... is a matter of the laboratory, of the field naturalist, of indefatigable digging among the ancient archives of the earth's history. If Mr. Bryan, with an open heart and mind, would drop all his books and all the disputations among the doctors and study first hand the simple archives of Nature, all his doubts would disappear; he would not lose his religion; he would become an evolutionist. Henry Fairfield Osborn, in "Evolution and Religion", The New York Times (5 March 1922), p. 91; written in response to an article a few days earlier in which William Jennings Bryan challenged the theory of evolution as lacking proof. The national Democratic Party, having absorbed the Populist Party and rebuffed its own northeastern conservative wing, became the bearer of agrearian demands in national politics. Thus it was that so much of the old populist program could be enacted years after the Populist Party and the Farmers' Alliance had faded away. The politically committed farmer and the extraordinary figure of William Jennings Bryan — at once a national party chief, agrarian social-movement leader, and the country's foremost progressive reformer — made this translation possible. This page was last edited on 19 March 2019, at 10:35.